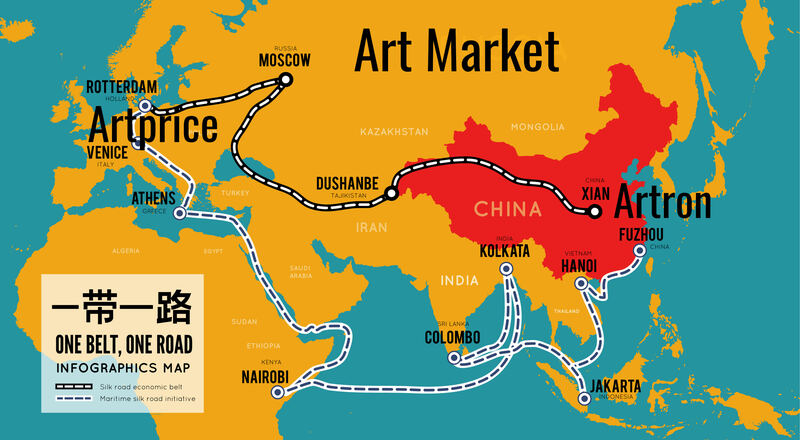 Artprice and Artron are adapting their 2019 strategy to the Art Market dimension of China's Belt and Road Initiative (BRI) that will be presented by President Xi Jinping this week in France. As part of China's Presidential visit to Europe this week, Mr Xi Jinping will be in France to promote China's New Sild Road over-arching development strategy known officially as “One Belt, One Road” (OBOR) or the “Belt and Road Initiative” (the BRI). In this context, Artprice, with Artron, will launch its official campaign with a new Chinese brand name and a new baseline in Chinese that will be communicated to the market before the end of March. This originally unplanned initiative – in compliance with the 2019 Chinese measures announced last month and effectively leading to a ‘new strategy' – has slightly postponed Artprice's initial targets, which otherwise remain unchanged. thierry Ehrmann: “By becoming a Chinese brand for China – taking into account the specific tastes of Chinese art lovers, collectors and professionals – Artprice is blending into the history and daily life of China's thousand-year-old culture, thereby boosting its notoriety and its sales turnover more quickly”.